Q. How do I allow my students to submit papers after the due date? 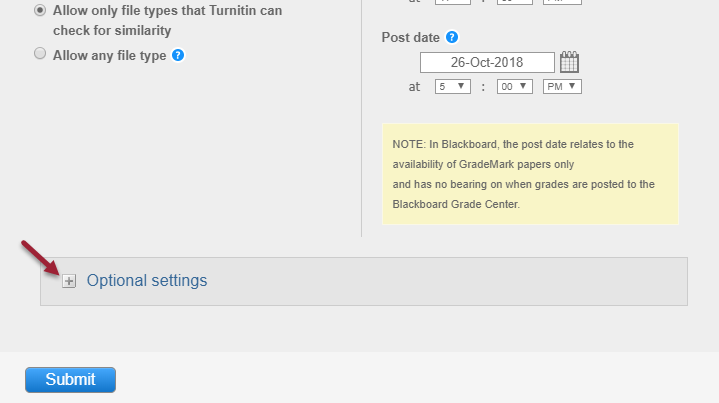 By default Turnitin will not accept submissions from students after the assignment's due date has passed. Choose the Edit Assignment tab and click on the Optional settings link. Select Yes under Allow submissions after the due date? then click on the Submit button at the bottom of the page. When enabled, students will be able to submit papers after the due date and time has passed as long as that student has not submitted a paper to the assignment link previously. For students wishing to resubmit, you'll have to delete their previous submission, to allow them to submit again.